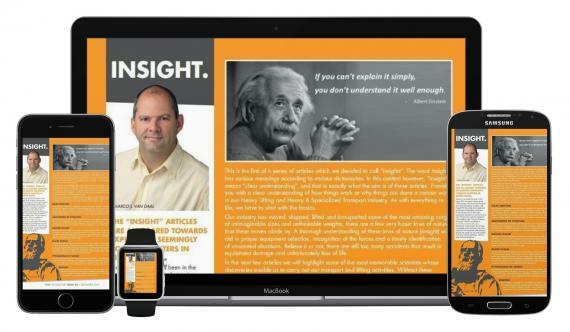 Did you see the first in a new series of articles called 'Insights' on page 13 of our latest Digital Newsletter? The word insight has various meanings according to various dictionaries. However, in this context, 'insight' means 'clear understanding', and that is exactly what the aim is of these new articles. To provide you with a clear understanding of how things work or why things are done a certain way in our Heavy Lifting and Heavy & Specialized Transport industry. As with everything in life, we have to start with the basics. Our industry has moved, shipped, lifted and transported some of the most amazing cargo of unimaginable sizes and unthinkable weights, there are a few very basic laws of nature that these moves abide by. A thorough understanding of these laws of nature (insight) will aid in proper equipment selection, recognition of the forces and a timely identification of unwanted situations. Believe it or not, there are still too many accidents that result in equipment damage and unfortunately loss of life. In these articles, we will highlight some of the most memorable scientists whose discoveries enable us to carry out our transport and lifting activities. Without these discoveries, our industry (and many other industries) would simply not exist. iBook will now save it to your PDF bookshelf – ready to read when you are!